'Pretty Butterfly' (Sass Brothers by Philip Edinger, R. 1999). BB, 24" (61 cm), Midseason bloom. 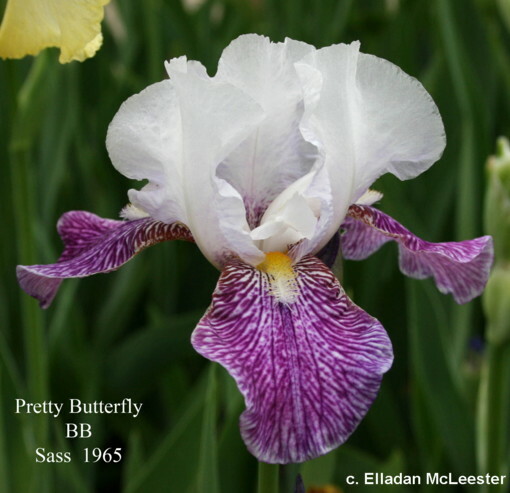 Standards and style arms icy lilac (RHS 76D); Falls icy lilac with network of violet (82A) veining; beards yellow, end white with hairs tipped yellow. Parentage unknown, diploid. In circulation prior to 1965.
jpg IMG_7834.jpg manage 474 K 21 Dec 2018 - 18:43 Main.davepote Photo by David Potembski, Presby 2016, Bed location 29-12.
jpg IMG_7835.jpg manage 427 K 21 Dec 2018 - 18:44 Main.davepote Photo by David Potembski, Presby 2016, Bed location 29-12. JPG prettybutterfly1.JPG manage 581 K 20 Jul 2018 - 00:22 Main.TLaurin Photo by Nancy McDonald-The Pickle Barrel Collection. JPG prettybutterfly2.JPG manage 561 K 20 Jul 2018 - 00:24 Main.TLaurin Photo by Nancy McDonald-The Pickle Barrel Collection. JPG prettybutterfly3.JPG manage 547 K 20 Jul 2018 - 00:27 Main.TLaurin Photo by Nancy McDonald-The Pickle Barrel Collection. JPG prettybutterfly4.JPG manage 748 K 20 Jul 2018 - 00:29 Main.TLaurin Photo by Nancy McDonald-The Pickle Barrel Collection. JPG prettybutterfly5.JPG manage 604 K 20 Jul 2018 - 00:31 Main.TLaurin Photo by Nancy McDonald-The Pickle Barrel Collection.